This luxurious vessel sails Portugal's enchanting and serene Douro River. The Viking Osfrid was named after the first vessel to sail from Norway to England under the command of Harald I, King of Norway. The Viking Osfrid has a wide array of cabins that are certain to cater to all the varying requirements of different guests. Whether it's an Outside, Balcony or Suite Stateroom, you are guaranteed to have an enchanting river view. 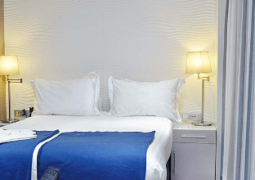 All staterooms are accompanied with luxurious amenities such as a flat-screen television, premium bathing products, hair dryer, safe and much more. If you book a Suite you'll have the added benefit of possessing a spacious living room and a full-size Veranda. On board the Viking Osfrid, you will be able to dine in luxury and take in the beautiful scenery simultaneously. The al fresco restaurant has a vast array of culinary options which is guaranteed to offer a unique and enjoyable dining experience. The chef's signature dish accompanied with the selected wine recommendations is certain to satisfy your taste buds. The mesmerising floor-to-ceiling windows enables you to take in the lush scenic views as you dine in luxury. There will never be a dull moment on board the Viking Osfrid, with various modes of entertainment that caters to all guests. People can converse with fellow passengers while enjoying a drink at the on board bar. The bar is also equipped with an open air 'Aquavit Terrace' which enables passengers to enjoy the stunning scenery. The on board library offers guests the opportunity to read and relax in a serene and peaceful environment. The Viking Osfrid has a variety of fun activities for you to try out. Both large groups as well as small are catered for. The large pool located on the 'Sun Deck' invites all guests to relax and have fun. The 'Sun Deck' also allows passengers to sunbathe and relieve stress in the simmering sun. The library offers guests the opportunity to read and relax in a quiet, peaceful and tranquil environment.